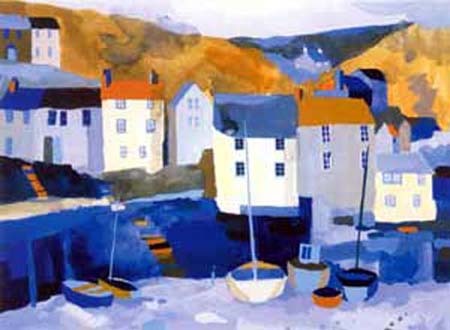 Limited edition silkscreen prints and gouache paintings of Cornish harbours and seascapes by the highly accomplished maritime artist. . . Richard Tuff is both an accomplished painter and printmaker. Having completed his studies at Winchester School of Art, Richard moved to Cornwall at the end of 1988 and began to concentrate on his paintings. He printed his first silkscreen with Coriander Studios in 1993 and transferred his gouache technique very successfully to the new medium. Since then his prints have gone from strength to strength with demand outstripping supply. His landscapes go beyond the traditional and demonstrate an interest in interlocking abstract areas to of subtle tones. His compositions are coloured in harmonious hues that cleverly capture the effects of light. 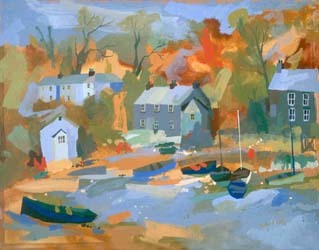 Richard often paints Cornish harbours and towns, each time evoking the essence of the West Country and its coastline. In the past his influences came from further afield, in the harbours and bazaars of Morocco and the street scenes of Brazil, where the emphasis remained on colours and light. However, like so many artists before him, the lure of Cornwall is very strong. It continues to be his greatest source of inspiration and his home.